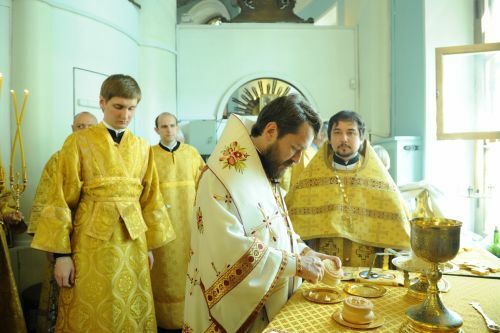 On July 22, 2012, the 7th Sunday after Pentecost, DECR chairman Metropolitan Hilarion of Volokolamsk celebrated the Divine Liturgy at the church of Our Lady the Joy to All the Afflicted-at-Bolshaya Ordynka in Moscow. He was assisted by Archimandrite Seraphim (Shemyatovsky), Orthodox Church of the Czech Lands and Slovakia, Rev. Alexander Piskunov, dean of the Moscow Patriarchate parishes in Sweden, as well as DECR staff members in holy orders and the clergy of the church. ‘In the name of the Father and of the Son and of the Holy Spirit! In today’s Reading of the Gospel we heard a story about how the Lord Jesus Christ healed two blind men who were sitting at the roadside and cried out to Him: ‘Son of David, have mercy on us!’ (Mt. 9:27). ‘When we read the Gospel we are often struck by how much place is given in it to stories about the Lord Jesus Christ’s healing the sick, the blind, paralytics, lepers, cripples – all those who needed to be healed from their illnesses not only spiritual but also physical. We also notice that in the ancient world, the sick and the healthy lived together, the poor, the sick, cripples and the blind who needed help and protection always sat at the side of roads travelled by the rich and the healthy. ‘Today the world is arranged in a somewhat different way: healthy people seldom see the sick, and sighted people seldom see the blind because, on one hand, people suffering from various diseases are taken away to special ‘reservations’ in which they stay together with similarly ill and infirm people and, on the other hand, a ‘reservation’ has been created for healthy people or those who consider themselves healthy, in which everything is arranged so that they could think as little as possible about illnesses, suffering and grief and may concentrate first of all on their own wellbeing and comfort. It is not accidental that even in TV programs on the life of our world and society, so little is said about illnesses, the sick, the need to help the sick and the suffering and so much time is given to propaganda of the temporal happiness based on material wealth and success. ‘That’s the way in which many live their life in a reservation created for them by society, by the mass media and by themselves. They feel comfortable and at east in this reservation. They are aware that somewhere beyond it there are the sick and suffering people, but they are consoled by the fact that the sick are taken care of by doctors and those who suffer are taken care of by those who should do it and who is paid for it. One seeks to live without thinking about suffering, illnesses, grief and sorrow. But one begins to think about it when an illness hits him himself or his loved ones. It is only at such a moment that the idea invades our comfortable human reservation that our life on earth is only temporal and that health is not something given, that it is there today and may not be there tomorrow, that we all are at the border between the road so comfortably travelled by the rich and the health and the roadside on which sit the poor, the sick, cripples and those who need help. We never know when this comfortable ride along the well-trodden road will end and when we will suddenly find ourselves at the side of the road of life. ‘Our Lord Jesus Christ came to the human world living in which are the rich and the poor, the health and the sick, the happy and the unhappy. He shared his life with all people. He mixed with people of diverse categories and diverse statuses. He never disdained such social outcasts as lepers, whores or publicans. Our Lord Jesus Christ did not consider the outward status of a person. He rather looked at one’s soul, and everyone, rich or poor, sick or healthy, happy or unhappy, has the soul. ‘When people come to the Church, they come to face the great reality of the Kingdom of God and the sorrowful reality of this earthly life, because everyone suffers in earthly life and everyone needs help and healing. If we are healthy today it does not mean that we will not commit a sin tomorrow and will have no need for the Doctor of souls and bodies Who is capable of healing our spiritual and physical illness. If we are happy today it does not mean that we will not be unhappy tomorrow, and this not even due to some external circumstances; for a human soul is made so that sometimes a person enjoys life but sometimes he feels sorrow and despair without knowing the reason for such a change. ‘The Lord has commanded us to be members of one body of the Church. As St. Paul says, ‘If one member suffers, all the members suffer’ (1 Cor. 12:26). We know very well from our own experience that if we have a toothache we will find no joy in fact that some other organs of ours do not ache, that the sun is shining, that we have received a bonus or in some other earthly delights; for as long one has a toothache one cannot enjoy life. Until he goes to a dentist and the dentist removes the cause of his suffering, he will not be happy. ‘Our whole earthly happiness depends on many external circumstances including those of our physical wellbeing. Certainly, we are dependent on these circumstances. But first of all we should remember that our health and our illness are in the hands of God. We should also remember that if there is an unhappy person next to us while we are happy, it is so for us to share our happiness and to help him as much as we can. If next to us is a poor man while we are rich, we should share our riches with him. If we remember it, if we do not shut our eyes to those sitting at the side of the road we travel, our way will be the direct way to the Kingdom of God, which the Lord called ‘the narrow way’. If we walk the road of life without noticing those next to us and those whom we can help, then it is the broad way that leads us to perdition. ‘Actually, it’s all very simple, what is difficult though is to fulfil in life what the Lord Jesus Christ has commanded us. But every time we come to church for the Liturgy, the Church, through the mouth of the Lord Himself, reminds us not only of the Kingdom of God which has come in power and in which we participate here but also of the world around us which needs that we hand this Kingdom of God, which has come in power, over to other people. ‘Let us pray that the Lord may give us strength to follow this royal narrow way leading to the Heavenly Kingdom. Amen’.